Take a second and try that schoolyard trick of patting the top of your head while rubbing your tummy. After the expletives have died down, you can better appreciate the challenges of being a Lead Singer/Bassist. The Lead Singer/Bassist is another unique brand of musician that deserves a little extra combat pay. Singers who play guitar have the option of coasting, or burying their mediocrity in the mix. The Lead Singer/Bassist is the center of attention AND the center of gravity in the band dynamic. One false step and the house of cards comes tumbling down. No surprise that in successful bands, the Lead Singer/Bassist shows a distinct predilection for control freakery. Here then, is my top 10 list of the greatest down-low multi-taskers; The Lead Singer/Bassist. 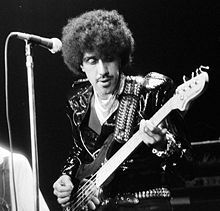 Best known as the singer/bassist/songwriter for the Irish pop-metal band Thin Lizzy; their best-selling 1976 single “The Boys Are Back In Town” was a smash on both sides of the Atlantic. American media would probably write him off as a one-hit wonder. However, he was a larger talent than that. Phil Lynott was a mixed-race baby at a time when such diversity was simply not accepted in Britain. This outsider status could account for his tortured Irish poet aesthetic and the drug and alcohol problems that dogged him until his death in 1986. Lynott’s trade mark was a mirrored pick-pick guard on his bass; a piece of stagemanship picked up from the many support gigs Thin Lizzy played with glam rockers Slade. Later years found Lynott enjoying notable solo success in Britain while at the same time battling substance abuse and ultimately, Heroin addiction. His legacy includes two books of poetry published in 1974 and 1977 that consist mainly of his song lyrics. great work! You realize, many persons are searching around for this info, you could help them greatly. hey over 50, thanks for the kind comments. Please share posts you think people might enjoy. “Word of share” helps greatly.